Osteopathy is a science in which the practitioner interprets a wide range of diagnostic clues in the search for the underlying cause of a problem. Claire Short could wax lyrical about neuro-muscular this or myo-fascial that, but she's been told by her partner to stick to plain English, so that’s what she's done! Pay attention. Essentially, if an animal’s structure (that is, its skeleton and all the attached muscles, ligaments and tendons etc) is not working properly, it is likely to prevent the animal performing its normal function. The principle applies equally to humans and dogs. It can also work in reverse – keep doing the same unusual activity and the structure may adapt to suit. And that can cause pain. So how is all this related to dogs? Like you, your dog can trip, fall, and sleep in strange positions, all of which may cause problems. Or your dog may require post operative treatment to help him or her recover from surgery. Agility dogs are particularly susceptible to work related injuries or muscular imbalances due to training. We all understand how repetitive strain from activities such as typing can cause problems in humans – training often imposes similar repetitive patterns in your dog. Also, remember that an increase in work or change in routine can provoke injury. An agility dog develops through physical training in exactly the same way a human athlete does, yet, sadly, we don’t often see ringside physical therapists waiting to treat the injuries. As we work our dogs, their muscles build up to help them fly over the hurdles and crouch low through the tunnels. As these muscles work harder they can get shorter, which may prevent your dog weaving through the poles so well. The muscles can also develop at different rates so one side may be more toned than the other. This may result in your dog having the most amazing height over hurdles, but always landing slightly to one side so losing valuable seconds in the race against the clock. I’m not for a moment suggesting that we should give up all training and leave our dogs to lounge about in front of the telly, but it is important to recognise the strains and pressures we put on their bodies, and to be aware that there are ways of making the dog more comfortable and reducing the chances of future injury. At the same time, this is likely to improve performance. At the first appointment the osteopath will need to know as much as possible about your dog: his knocks, falls, strange behaviour, exercise routine, feeding, surgery, and general health. 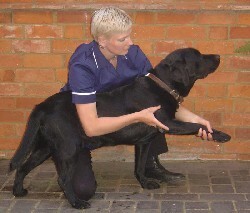 After taking the history, the osteopath will look at how your dog moves. He or she will check the joints and muscles for any tightness, and will examine the whole dog, since the cause of the problem is not always where you think it might be. Don’t be surprised if your osteopath examines your dog’s head when you were convinced there was a problem with the back legs! Your osteopath will need to contact your vet to obtain permission to treat your dog. This is a legal requirement and this also provides the opportunity to ensure the osteopath knows the animal’s complete medical history. Most vets are well aware of the benefits of osteopathy, and will ask the osteopath to let them know what they find during treatment. 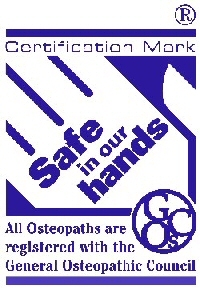 Osteopathy is not just about clicking backs. You may see your osteopath using stretches, gentle joint mobilisation and massage-like techniques to remove any imbalances in mobility. Manipulation (clicking), is used when necessary, and despite the noise is painless. Another, very gentle, technique is cranial osteopathy. This is a subtle method of treating and may send both you and your dog to sleep! Don’t be fooled, though, it is a powerful way to rebalance ligaments, and strains throughout the body. You may also be advised on exercises or stretches to incorporate into your training time. This is particularly important for agility dogs as some of their muscles are prone to getting very tight. How do I know if my dog needs treatment? How often will my dog need treatment? How often your dog needs treatment depends very much on how often you are competing together, how you train, and what injuries your dog sustains. Olympic athletes (human and animal) have access to physical therapy on a regular basis because they are pushing their bodies to extreme levels of fitness. The rest of us (including our dogs) would probably benefit from a regular MOT every four to six months, just to keep everything in good working order, and more intense treatment only after specific injuries. The most wonderful part about having your dog treated is seeing him or her jumping for joy with no pain and no uneven movements. As they say on Agilitynet, here’s to happy jumping! If you are not in the Midlands, North London or South East of England and would like to find out more about osteopathy for either your dog or yourself, please see below. To find a dog osteopath in your area please contact Stuart McGregor at the Osteopathic Centre for Animals on 01235 768033. 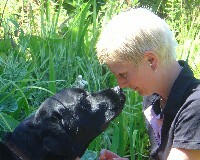 He will be able to put you in touch an osteopath specifically trained to treat animals. Claire Short has been surrounded by animals since she was a child. 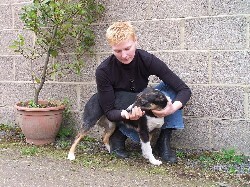 After completing the five year training to become an osteopath she trained to treat animals too, and now works in the South East, North London, and Midlands treating dogs, horses, cats and (surprisingly) a number of sheep. Currently her lumbering Labrador’s lack of interest in agility prevents her competing, but the two of them persevere none the less!